Hearing loop enables everyone to celebrate at Boutwells Landing. Boutwells Landing is a senior living center located in Oak Park Heights, Minnesota. Residents, along with Boutwells staff, have established a vibrant community there. A group of residents convinced management staff that hearing loop technology could help those with hearing aids continue to participate and stay active in their community. In early 2015, Boutwells commissioned Midwest Hearing Loops (MHL) to install a hearing loop in the Town Square community room and in the Chapel. These rooms are used often for gatherings, movies, presentations by outside speakers and religious services. One favorite tradition is to hold a monthly birthday party to celebrate with everyone who has a birthday in that month. Because friends and family from the broader community join with Boutwell residents, these celebrations are large. Last month they combined their birthday party with a celebration of Christmas. 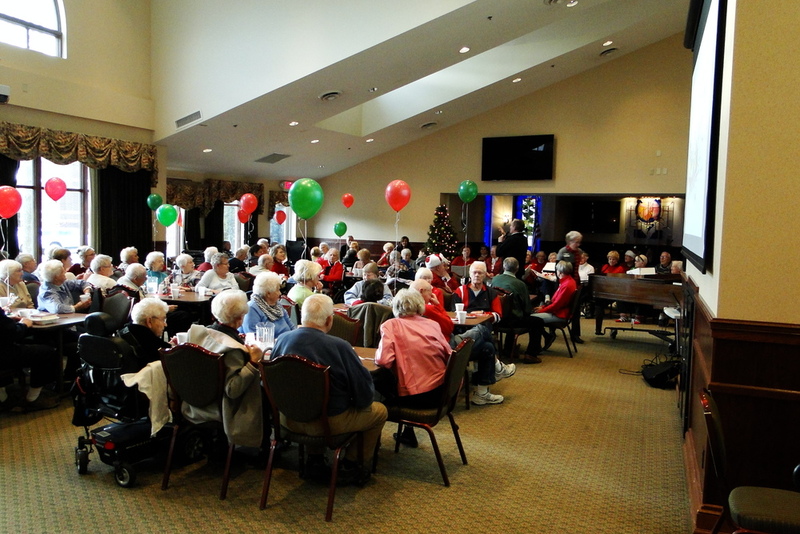 In addition to “Happy Birthday” everyone had the opportunity to sing Christmas carols with musical accompaniment. When I found out about this gathering, I decided to attend to verify that the hearing loop was performing as designed and to talk to users to get their impressions. Measurements with MHL test equipment and loop listener confirmed that the hearing loops were performing properly. But the real indication was on the faces of the residents who were relying on the system to hear the presenter, and on this occasion, to join in with others in the singing.